My mum gave me these two little tubs of joy a few months back when she was having a clear out of all the products she doesn't intend on using. Usually the ones that come in the box sets or unwanted gifts. I love it when I hear 'Would you like these?' 'Yes mother' haha! 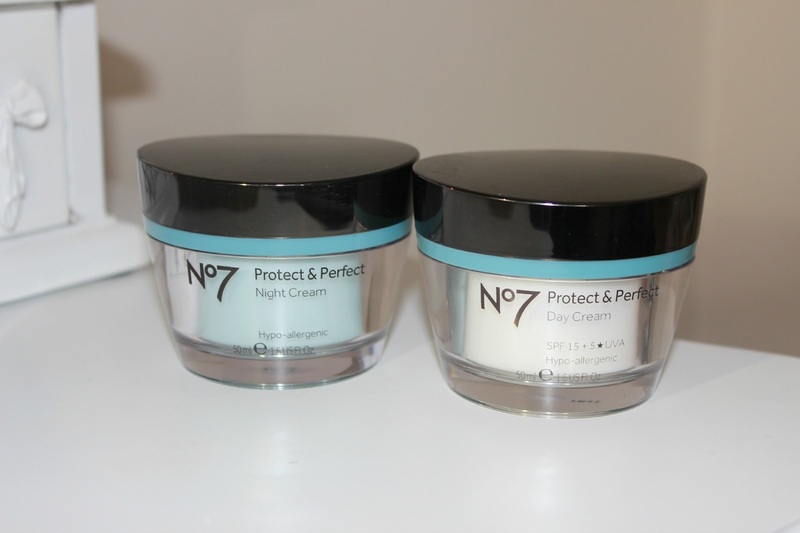 No.7 Protect and Perfect day cream and night cream aim to protect your skin from the first signs of ageing, boost radiance and improve any little fine lines that you may have. I've been using these moisturisers regularly for the last month or so. You get 50ml of product within each tub, which is the same amount that you get within the Estee Lauder - Day wear pots. The design and packaging does remind me of the Estee Lauder range too. The day cream is a really light moisturiser that absorbs into the skin within seconds. Leaving my skin feeling so much healthier right away. I apply my day cream in a morning with my finger tips after I've cleansed my face and just before I apply my make up, as I find a good moisturiser always creates a good base for your make up. The day cream contains SPF 15, 5*UVA and is hypo-allergenic. Having an SPF within the cream is a big plus to me, as you know sun ages the skin and you've got to think how exposed our skin is to the sun from day to day. It's a must that you look after your skin. We don't want to be looking like a rasin when we're 30 do we? 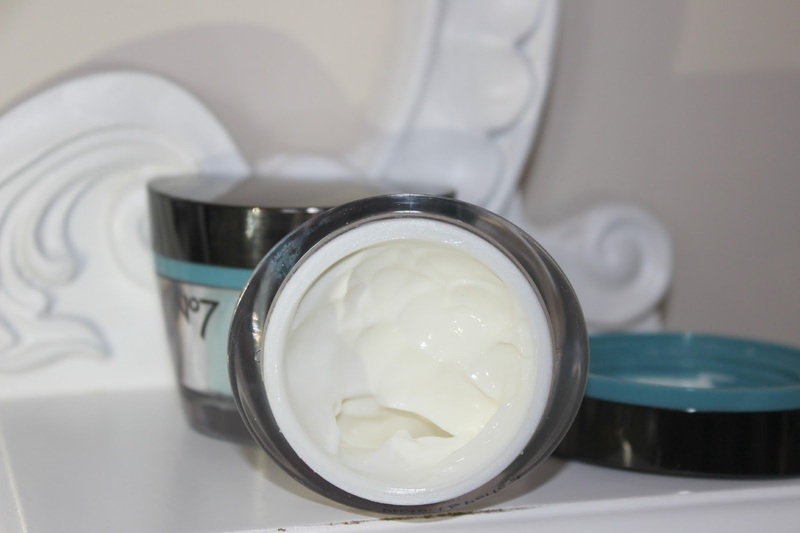 The night cream is a little bit thicker in consistency compared to the day cream, but it's not too heavy like some night creams can be and it doesn't have an SPF within it. Not that it matters, no one catches the sun through the night do they? I use the night cream after applying my Trilogy Rosehip Oil and again I just work it into the skin with my finger tips. When I wake in the morning my skin is left feeling really smooth and hydrated. It feels and looks how it did after it soaked into my skin before I climbed into bed. You wouldn't be able to tell that I suffer from really dry/dehydrated skin. As I have mentioned above I suffer with dry/dehydrated skin and I also have visible acne scars. My scars appear to be less visible after using both of these No.7 creams and the Trilogy Rosehip oil for the last few months. I hope they continue to improve the appearance of my skin as it slowly builds confidence for me and means me wearing lighter foundation throughout the Summer (that will be a first). I haven't had any breakouts since using these creams, which can happen as your skin adapts to the new product. My skin has been looking more radiant than ever. Not too sure about the fine lines though, but maybe this will prevent me from getting any wrinkles. You can purchase both of these creams for your local Boots store or online at www.boots.com No.7 day cream is £22.00 and the night cream is £23.00. You can also buy these creams in the intense version if you like your moisturisers a little bit heavier. The price may seem a little steep, but to me it feels a lot cheaper as I was paying £40 a pot for Estee Lauder - Day Wear and I just can't keep paying that. What creams do you like to use morning and night? my skin is looking really lacklustre recently - I am in desperate need of luminosity and hydration so think I might invest! I've never used No•7 before but they sell it at Target and I'm always seeing it there. I'm happy to know that your acne scars are disappearing (although nobody would ever know you had them! ).